This bike may be intended for small boys, but as the name suggests it might not be suited to the more timid variety! With rugged build from good quality materials, the bike is tough enough to withstand considerable abuse (or "enthusiastic use"!). And with a freestyle BMX frame, it will handle whatever stunts your particular small boy may wish to try - suitably attired in protective clothing and helmet, of course. 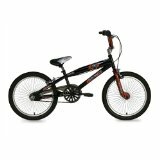 The Aggressor has 20-inch wheels and alloy brakes.